In this centenary of the end of the First World War and the media hyping of Remembrance Day we have stories like “How Lloyd George Ended the War” along with praise for Marshal Petain, the arch-militarist and leader of the Vichy regime from French President Macron. We are told the Allies were fighting for “civilisation” and democracy against Prussian militarism. Curiously the German Empire from 1871 to 1918 (and the North German Confederation before it in 1867) had universal male suffrage whereas universal male suffrage was not introduced in Britain until 1918 (women in both Britain and Germany had to wait until after the War for any voting rights). But how did the World War Really end? In fact, it was the working class that brought about the end of the War through disorder, riots, mutinies, strikes and indeed two revolutions. The First World War was a watershed for the workers movement. The majority of the Social Democratic Parties in Europe, including the Labour Party, took the side of their particular states, whilst syndicalist unions like the Confederation General de Travail (CGT) which had promised a general strike if war broke out, caved in and were swept away by war fever. A minority of social-democrats like the Bolsheviks and the Menshevik Internationalists in Russia opposed the war. A minority within the anarchist movement supported the Allies, with the majority taking clear anti-war positions. In fact, the Armistice signed by Marshal Foch with the German military leaders on November 11th 1918 did not end the War. Fighting continued on many fronts with a result that 10,000 were killed, wounded or reported missing on that day. Indeed, the Allies continued to wage war with the new Russia created by the February and October Revolutions long after the signing of the Armistice. Britain and France eventually withdrew from Russia in April 1919 because of strikes and mutinies in their own countries. In Britain and France in there was great support for the War. In Germany there was a more subdued support for the War, whilst in the Austro-Hungarian Empire the subject peoples-Slovenes, Czechs, Ruthenes, Croats, Serbs, Italians etc- were tepid about mobilising. This less than enthusiastic support for the war became more pronounced as the Austro-Hungarian Empire quickly suffered several defeats. In Russia there was discontent from the start and a defeatist attitude towards the Tsarist autocracy’s direction of the war. This become more pronounced from 1915 with the start of mutinies within the Russian Army. In Britain the Labour Party supported the War, in France the Socialists in general and the unions did the same, with the exception of Jean Jaures whose anti-war stance led to his murder. In Germany the Socialists rallied the German working class with the defence of civilisation against Russian autocracy and barbarism. The German trade unions banned all strikes, the only exception being the anarcho-syndicalist FVDG whose anti-war position led to their banning by the State. Those Socialist MPs- Liebknecht, Ruhle- who had anti-war and internationalist positions, failed to vote against war credits in the German Parliament on August 4th and obeyed Party discipline. Only one socialist deputy abstained and he failed to make any political statement about this act. The First World War followed the American Civil War in its industrialised slaughter. Casualties began to mount and in Britain this led to the introduction of conscription in January 1916, resulting in draft dodging and conscientious objection. Within the Russian Empire war weariness, exacerbated by food shortages, grew and in February 1917 women workers and housewives demonstrated on International Women’s Day with the slogans of Down With The War! And Give Us Bread! They brought out male workers in the factories and combined with soldiers’ mutinies this brought about the February Revolution. The February Revolution in Russia had immense sympathy among the working class internationally, first of all because it was seen as a way of ending the War. In Germany living standards began to fall because of the war and the allied blockade. Prices rose and inflation soared. Wages fell and by 1915-1916 many foods became scarce, with a veritable famine. However, the rich were protected from this suffering, and this included the officer class within the army and navy. This developed a class consciousness and a polarisation between the ruling class and the mass of the population. Starting in 1916 workers ignored the Social Democratic Party and the trade unions and took part in direct action and strikes to improve their situation. The following year there were massive strikes throughout Germany. The worsening food situation was aggravated by a fuel shortage. The Russian Revolution further added fuel to the fire. In April 1917 there were huge strikes in Berlin, Leipzig and elsewhere. 200-300,00 went on strike in Berlin against a decrease in bread rations. In Leipzig the strike became openly political with demands for peace without annexations, and freedom for political prisoners. The strikes were followed by hunger strikes in the Navy against the decrease in food rations. The officers were thoroughly hated for their arrogance and the fact that they were better fed. In August mutinies broke out with sympathy strikes in Wilhelmshaven harbour. The High Command reacted with repression and two sailors were executed. Massive demonstrations followed in German cities in November 1917. In January 1918 in Austria, which faced a similar situation to Germany, there were massive strikes and demonstrations because the peace talks with Russia were failing. A massive strike followed in Berlin on January 28th. The demands of the strike were: workers’ representation in the peace talks, better food, the end of martial law, and a democratic regime in Germany. The strike spread to many towns and cities., with over a million on strike in the next few days. The authorities replied with repression, deploying police and the military. The strike failed but in July and August wildcat strikes broke out, but they were soon defeated. Serious defeats increased the number of desertions. By late October the German High Command attempted a naval attack on Britain. Sailors at Wilhelmshaven and Kiel were expecting peace and feared that this expedition would destroy any chance of peace negotiations and that the officer class were planning a coup d’état. Mutinies broke out. 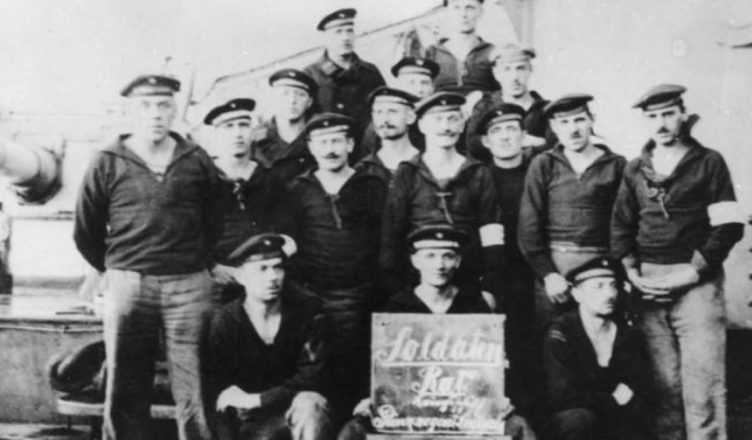 Sailors took over Kiel forming sailors’ councils with dock workers also creating workers’ councils. The rebellion spread to other ports and harbours. This was followed by a spontaneous uprising throughout Germany. Soldiers refused to fire on the demonstrators. Workers, soldiers’ and sailors’ councils emerged everywhere. On 9th November the Kaiser abdicated and fled to the Netherlands. The monarchy was ended and the new republic began peace negotiations with the Allies. The action of the masses had brought about the end of the War. As we have seen there was also unrest in Austria. Mutinies broke out in Czech and Ruthene units in June 1916. And these spread in 1917 and 1918. On February 1st, 1918 a mutiny broke at at Cattaro (Kotor) in Montenegro with Czech and Italian sailors in the forefront. A red flag was run up on the cruiser St George. The mutiny was crushed, with 4 of its leading lights executed. In France where soldiers suffered great suffering in the trenches mutinies began in May 1917. The 21st Division revolted and its leaders were shot. Revolts followed in the 120th Division and then the 128th. Twenty thousand deserted. The authorities reacted with a mixture of repression and compromise, executing 49 whilst promising more leave and better conditions. At least 918 French soldiers were executed during the War. Russia had sent two brigades to fight with the French Army in 1916. Mistreatment by the French led to unrest, with an outright mutiny taking place in May 1917. The French then moved the brigades to La Courtine, an isolated camp in south central France. Here they held mass meetings and refused to return to the French front, having already suffered 4,000 casualties. They elected soldiers’ committees, refused to recognise their officers and defied the Russian High Command. The French military, in collusion with the new Kerensky regime in Russia, surrounded La Courtine and began an artillery bombardment. Hundreds died. Within the Bulgarian Army unrest led to 600 executions. In Italy, which had joined the carnage later than the other combatants, there was an officer class that was drawn from the upper classes and which looked on the rank and file with contempt. Soldiers were seen as completely expendable resulting in huge losses. 750 executions took place with many hundreds of other summary executions. 25,000 deserted, 5,000 defied the callup whilst 34,000 others obeyed the call-up but deserted before mobilisation. There were mutinies in the Army with the Ravenna Brigade revolting in May 1917 and the Catanzaro units in July 1917. These were brutally repressed. Within the British Imperial Army, where there was a similar class divide between the officers and the ordinary soldiers. Soldiers were flogged and manacled for trivial offences. New Zealand troops mutinied at Etaples in September 1917. Later in the month a mutiny resulted in 23 deaths at Boulogne. Strikes broke out in labour battalions on September 11th, and mutinies continued through to 1918. Resistance to the war expressed itself in self-inflicted injuries to avoid being sent to the Front. As a result, 3,894 soldiers were sentenced to prison for these actions.